How Strong Are Our Leaf Netr Nets? We did a little experiment. We brought out the forklift, balanced a leaf netr between the forks, and Kim stepped in one net. She's about 100 lbs, and it held her just fine. Nothing tore, nothing pulled out of the frame. Then Steve, who's about 200 lbs. did the same thing. We got the same result: no rips or tears, nothing pulling out of the frame. 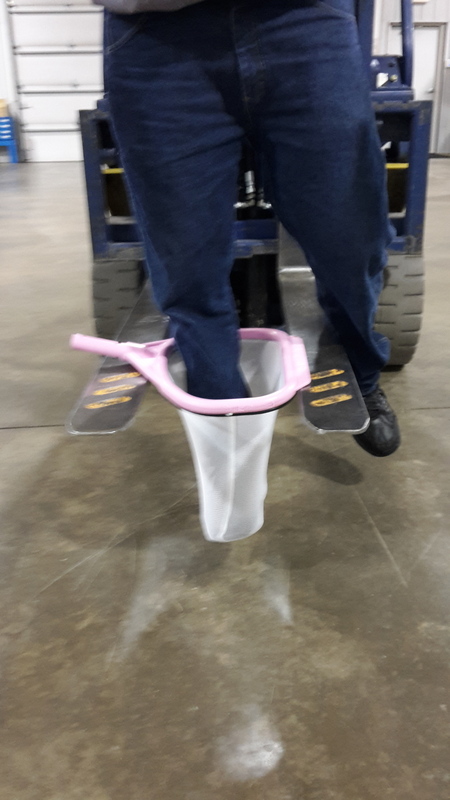 Try doing this test with nets you see at Wal-Mart or your local pool supply store. Try this with all of the usual nylon nets and we're betting if you do, you'll soon find yourself wanting a leaf netr! Older PostWith Our Pool Netr, Spa Netr, and Leaf Netr, We've Got You Covered!